[These are my notes from a keynote I gave at Plymouth State University on June 1, 2017, as part of their ATI Camp. The video of the presentation is available here (also, don’t miss Rajiv’s and Robin’s talks). This talk is based on an open access paper Jen Ross and I published earlier this year in Open Praxis. The Pont des Arts in Paris. Lovers from around the world placed locks on the bridge, often inscribed with their names, to signal the eternal nature of their love. It’s a romantic gesture…full of hope and dreams…once you lock your love onto the bridge and throw away the key (I imagine a myriad of keys at the bottom of the Seine river), your love will last forever. I had the opportunity to see the Pont des Arts a few years ago on a family trip to Paris. Here is a picture of my son checking out the thousands of locks. I’m fascinated by the stories of things and, well, locks on bridges tell a lot of stories. Some locks were decorated, extravagant; some were simple and humble. Some had dates, wishes written on them. Some were nameless. Eventually, parts of the bridge collapsed into the river. 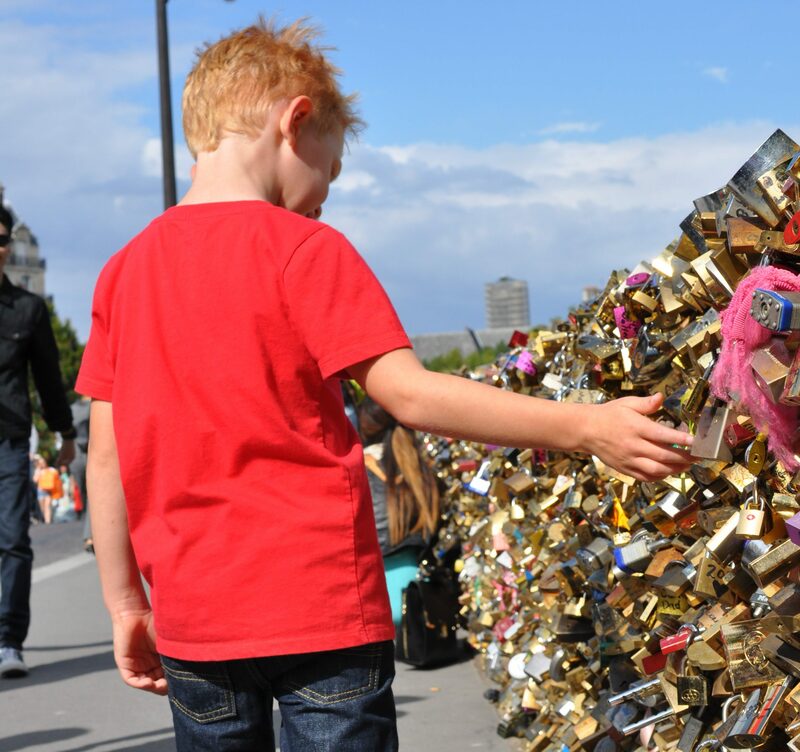 When the Parisian authorities finally removed the locks, they removed somewhere between 45 tons – 65 tons of locks from the bridge. Now it would be pretty straightforward for us to draw a connection between the unintended consequences of closed/locked practices in education to the locks on our bridges. The weight of the costs of education, as Rajiv talked about in his keynote yesterday, may place crushing pressure on our students and cause them to experience significant long-term damage (financial and otherwise). This makes a lot of sense to me—students are experiencing heavy financial pressures and it seems that those will only increase in the current administration. So yes, please start removing those locks. And if this analogy is helpful in your discussions of open education on your campuses, by all means use it. But to me, the story of the Pont des Arts is also a story about unintended consequences. Despite our goals, our dreams, the locks have unintended and damaging consequences. The point of my presentation today is to also look at the unintended consequences of openness and to take a critical stance on the ways openness and closedness are framed in opposition. As someone who was working at Stanford during the MOOC craze a few years ago, I feel confident saying that the word “open” has become a way to describe a whole range of digital practices, some of which could be seen as antithetical to the vision advanced by early advocates of openness. Proponents of openness have struggled with the need to make openness inclusive while also taking a stance against forms of openness that may work against their values. The term open, when framed only against the idea of closed, creates a situation where a whole range of things that could be considered open are deemed closed and a whole range of things that are considered closed are deemed as open. The key is that, within the notion of openness, there is a lot happening around our values, our ideologies, our politics. What we believe the state of the world and of education and of students should be. I don’t want to dissuade you from open practices and open educational resources, but I ask to consider the implications of openness and closedness and, rather than think of them as opposites, or solely as part of a spectrum, to consider them as always co-occurring and permeable. I ask you to consider what practices “openness” reinforces, what assumptions, what openness tidies or obscures. 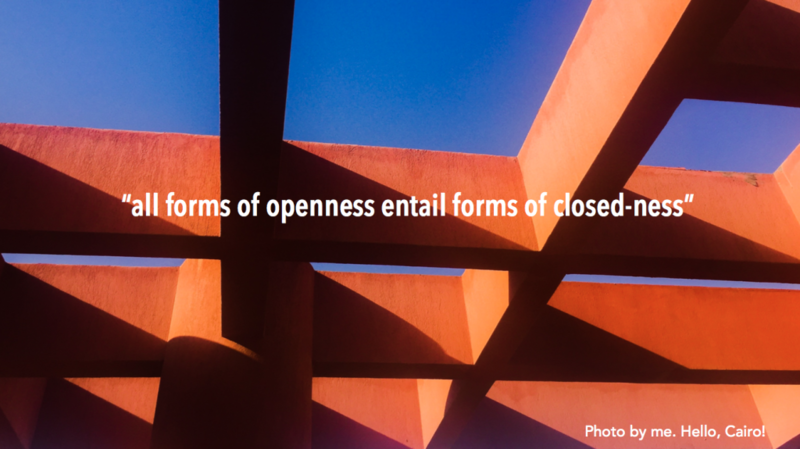 As Edwards (2015) says, “all forms of openness entail forms of closed-ness” (p. 253). Choices around open practices involve “selecting” and “occluding other possibilities” (p. 255) and, therefore, educators cannot claim openness as an educational value in its own right. My main thesis today is this: The opportunity for exploring openness and closedness, and boundary crossing / permeability among between them, provides the opportunity for us to critically question our educational and teaching practices. By adopting openness as an unquestionable or unassailable virtue, we run the risk of missing that opportunity. It would be a mistake to do the exact same things we would do with open practices as we would do with closed practices. Instead, we should explore how critical lenses like complexity theory and not-yetness, a term that my colleague Jen Ross and I coined a few years ago, can help us to approach openness with attention to issues of multiplicity, uncertainty, and transition –or what we can “boundary crossing” between openness and closedness. There is truly exciting and transformative work we can do as we critically explore openness and closedness. In a recent paper that my colleague Jen Ross and I wrote, we noted several critiques of the open movement and how many of those critiques help us to think more broadly and creatively about what our goals are when we pursue openness. Today, I want to highlight three key critical concerns that counter a utopian view of openness: 1) there are definitional issues with openness, and often a false binary is established between “open” and “closed.” (issues of definition also lead to problematic “openwashing” – the issues of branded digital content); 2) an overemphasis on access to content homogenizes learners and their contexts; 3) open educational practice does not attend sufficiently to issues of power and inclusion. 1) Definitional issues. There is a false binary is established between “open” and “closed”—I have already discussed these a bit in my intro. These issues often have at their heart a tendency to frame openness as “good,” as in the statement made by several open advocates that “the opposite of open is broken.” There is a risk of foreclosing conversations about the a deeper, and more political, goals of openness. Wikipedia is often held us as the ultimate success story for openness. And, to be fair, Wikipedia is pretty impressive. And, as Rajiv pointed out yesterday, working in Wikipedia can be a great way to give students voice and agency in the digital spaces they sometimes inhabit. In that vein, you could consider (and I think we mostly would consider) editing Wikipedia to be part of open practices. But, if we stop there we might miss to dig deeper into this open practice. Wikipedia is driven by a need for consensus. An authoritative and accurate voice. In the many processes that Wikipedia editors undertake to provide authoritative articles, consensus drives out inclusivity, multiple voices, personality, nuance, creativity. And, in driving those things out, it becomes a lot less “open” than we might have originally thought. As Mike Caulfield writes: “Ten of thousands of hours are spent editing Wikipedia’s top articles, but for the most part they aren’t spent coming up with new ways to explain things, or updating articles with new research. They are spent are the never-ending pulping out of voice, perspective, bias, and differing opinion about what belongs in the article. Only a sliver of writing – even good writing – makes it through.” It’s not that Wikipedia is “closed” either. It has been an impressive model of leveraging communities to put forward and handle a lot of information. The issue is that simply branding Wikipedia as “open” can foreclose conversations about its areas/practices of openness and its areas/practices of closedness. I’m not arguing that we should stringently define open and call everything that doesn’t fit that definition “closed.” That would be a mistake. We could waste a lot of effort building openness rubrics for how well something fits the 5Rs discussed yesterday. We could spend a lot of time judging the merits of this so-called open thing versus that so-called open thing. The point here is that we should look carefully at the things we call “open.” When we recognize that our practices simultaneously include openness and closedness, we talk less about definitions and more about why we are doing what we’re doing. As Gert Biesta likes to say, the for whom and for what of openness. This gets us more to the political and value-laden work of openness. 2) Overemphasis on access to content can homogenize learners and their contexts. This is perhaps the most common critique of open education, that it often focuses too much on content and delivery of content. If we believe that education is more than a delivery of content, then an exclusive focus on the content of open education and how accessible and affordable it is gives too much weight to instrumental goals of content creation and dissemination. In the dominant discourse about openness, open content and Open Educational Resources in particular embed values of access, standardization, and deinstitutionalization. Their “emphasis on replication” presumes the uniformity of learners (Knox, 2013a, p. 29). Jen and I wrote in our paper: “It would raise the question of what, precisely, is transformed or transformative about OERs, and might prompt us to view them as aligned with unhelpful “politics of complexity reduction” (Gough, 2012, p. 47). As McArthur (2012) puts it, complexity reduction leads to “bad” rather than “virtuous” mess: “Seeking to force the inherently messy into a respectable tidy form can result in something that distorts, hides or falsifies the actual social world” (p. 421). Promises of simplicity—access, standardization, deinstitutionalization—come at a cost.” To focus on the diversity of learners and away from the instrumental goals of education would make openness and its goals more open to interpretation and to contestation. 3) Open educational resources and practices may not attend sufficiently to issues of power and inclusion. There is a view that the main issue facing open education is how to separate content from elitist, expensive, restrictive, or exclusionary processes and make it more widely and freely available. How to make more free and open textbooks. How to publish in open access ways. However, critiques of Open Education ask us to question whether our open practices “reproduce historically asymmetric power relations” (Olakulehin & Singh, 2013, p. 33) in the same way our so-called closed ones do. Amiel and Soares (2016) observe the need for advocates of openness to be vigilant: to avoid constantly replicating inequalities in terms of those who produce, develop skills and revenue, and actively participate in the commons, and those who are passive observers mostly assimilating the offerings that are made available (p. 1). In many cases, the privilege of creating OERs is often not afforded to people who work with under-resourced and under-represented students, which can lead to the creation of resources that do not address the needs of those students. Think about who the top MOOC providers were. They weren’t community colleges, who have a broad access mandate and who serve incredibly diverse populations. They were mostly elite institutions, with resources to create and push out branded content. Morris and Stommel (2014) argue that “openness can function as a form of resistance both within and outside the walls of institutions. But open education is no panacea. Hierarchies must be dismantled—and that dismantling made into part of the process of education—if its potentials are to be realized”. Where do these critiques leave us? I referenced today’s talk as critical, but generative lenses on open education. I believe these critical lenses afford the opportunity to explore really interesting possibilities. In our paper, my colleague Jen Ross and I proposed that open educational theory and practice needs more attention to issues of multiplicity, uncertainty, and transition—the latter we frame in terms of ‘boundary crossings’ between openness and closedness. The concept of ‘not-yetness’, developed to respond to issues of oversimplification in digital education policy and practice, offers an approach to meeting this need. We were resisting the tendency to want to simplify and solve problems with technology. We believe that what makes the use of technology in education so potentially transformative are the ways in that it is not yet fully understood and not yet fully researched. These are characteristics we believe should be embraced. Multiplicity & emergence: If we take seriously the idea that all forms of openness entail forms of closedness, then we must recognize that there are many forms of openness; many ways to be open and closed. Not-yetness suggests we diversity and context are undervalued when we understand openness in limited ways. As we create open resources and open practices, think of the many ways and contexts in which it might be used—open the possibility of multiplicity. I want to share two examples, both from our paper, that we think show the possibilities for openness when we embrace multiplicity, boundary crossing, and uncertainty (you can read more about these examples in the paper). You may see that open-endedness, complexity, risk are pretty integral to these projects as well. Students engaging agents “beyond the course”: Student blogging is a form of openness that can allow for multiplicity, uncertainty, and boundary crossing. Again, I think the key here is agency. We want students to have the opportunities to experiment with identities, to set their own limits on the web, to own and make decisions about their data. Part of the process of developing pedagogies that involve openness is considering how environments and practices can support students to set such limits (which we might productively think of as ‘closures’). At Middlebury, we have been helping students develop that agency by doing a domain of one’s own project, called MiddCreate. As part of MiddCreate, we have seen students exploring a multiplicity of voices (political, academic, professional), identities, and connections. It creates risk and uncertainty, inside and outside of classes and curriculum. But it is in the engaging with these uncertainties that we see some pretty amazing student creations. Federated wiki, wikity: From our paper: “Caulfield proposes a federated wiki as a wiki infrastructure that upends collaboration-by-consensus by allowing an individual to maintain their own copy of a wiki page that they can edit and individually control (Caulfield, 2016b). Unlike traditional wikis, federated wiki pages resolve to multiple servers but remain connected so that individuals’ copies stay linked to other copies. Federated wikis allow individuals to manage and control content while also freely sharing the content that they add and manage: a form of boundary crossing. I know you have work to do today. I want to encourage you to explore the not-yetness of your open practices. I will offer these three questions as supports for such exploration. 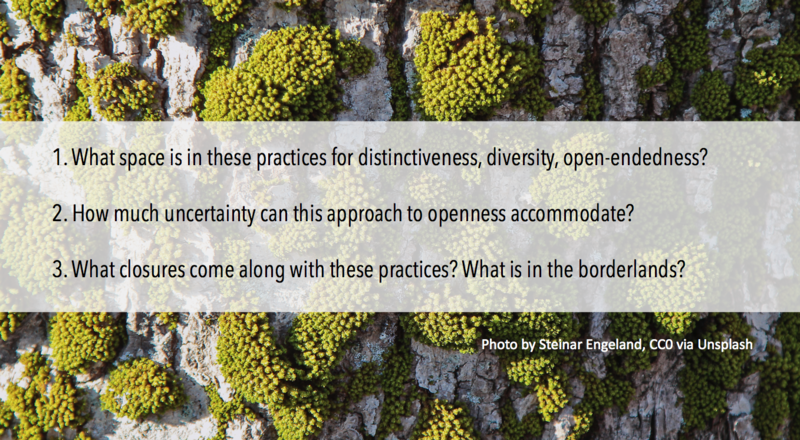 What space is in these practices for distinctiveness, diversity, open-endedness? How much uncertainty can this approach to openness accommodate? What closures come along with these practices? 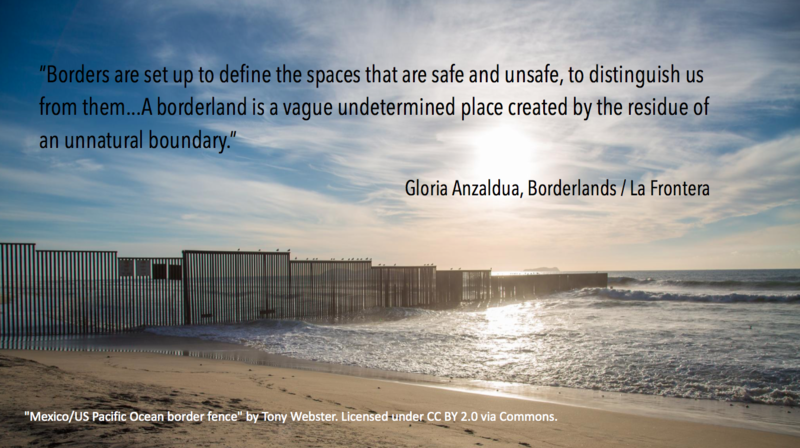 What is in the borderlands? In addressing questions around open-endedness, uncertainty, and boundary crossing, we can create more critical space for our open educational practices, and challenge some of the constraints occasioned by an overemphasis on the content of open education. Previous Post Previous post: Hidden immigrants & belonging: What do these mean for Domains?